This is my top goal, I am planning on going on a Trek America trip in the summer which includes LA, San Francisco and Las Vegas. I would travel on my own which is super scary but I want to go back to LA so badly! Maybe this is a tad ambitious? I want to work hard on achieving a healthy body and one that I am proud of! I have been working out regularly for the past couple of months so I just want to carry on with that! I keep meaning to do this but with two jobs and uni, I don't have much time left! I want to take an evening class in something, perhaps yoga/Pilates or jewellery making! I feel like last year, I neglected my blog a little because I was so so busy. I want to make sure I spend time working on it and make it as good as I possibly can! I feel like I've just put this in as an excuse to buy another Mulberry bag or pair of Louboutins. I am having withdrawal symptoms! But I think it's nice to have a classic piece of clothing or accessories, I would much rather have one long lasting, classic piece than lots of not so long lasting items! This links with number two and I am gradually achieving this even though I haven't been working out that long. I think confidence is so important to have and feeling good in your own body in essential. I think I could be vegetarian, I wouldn't miss much...maybe Wagamamas Chicken Katsu Curry!! I think I would just generally like to improve my diet, even if I didn't go vegetarian, eating better is a goal! Sometimes, I worry what other people think too much and this stops me from properly having fun. I want to just say yes to things and *attempt* to be a tad more sociable, like go out with friends more as I feel like last year I said "no" too much. I would love to go on a spa weekend where no phones are allowed and we just relax! Although, I am very attached to Instagram so I'm not entirely sure how that would go! But just take a few days out to spend time with friends. I would love to start being able to speak French again, I was never fluent but I was so much better than I am now! I can barely say a sentence anymore! I always wanted to take ballet classes as a child, I recently found out about Barre classes and they sound great for keeping toned and improve flexibility and grace (I have none of this) so this is definitely a must! Edinburgh is a city I have always wanted to visit so would love to go this year! I wanted to do the colour run last year but didn't get around to it, I've been working out a lot more so hopefully I manage to run without dying. I tried to make macarons a while ago and they weren't the best thing ever, ha! I want to learn how to make proper macarons that look like they're from Ladurée..maybe that's a bit ambitious. This speaks for itself, I would love to reach 2000 bloglovin followers! I used to be fluent in French (my dad and half-brothers live in France), but now I can barely string together a sentence, so I know how you feel! I'd also love to make more time for my hobbies - I neglect my blog and my body so badly sometimes. Barre class sounds so much fun, but my town isn't exactly up-to-date with it's fitness equipment, so... we'll see! 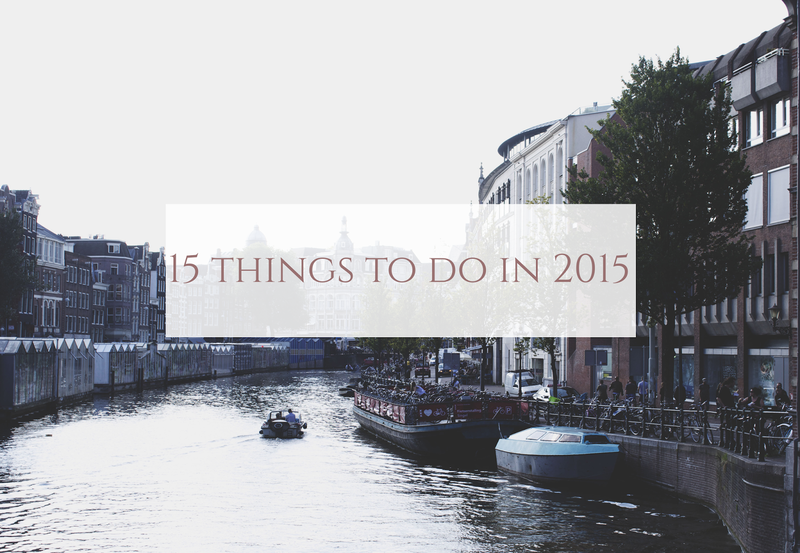 I hope you achieve everything you want in 2015! i'm sure you'll get to 2000 BL followers well before the years out! I'd love to do a Trek America holiday but my hubby isn't keen so I doubt i'll ever get the opportunity - i bet they're absolutely fab though!